Cute just like it looks in picture!!! 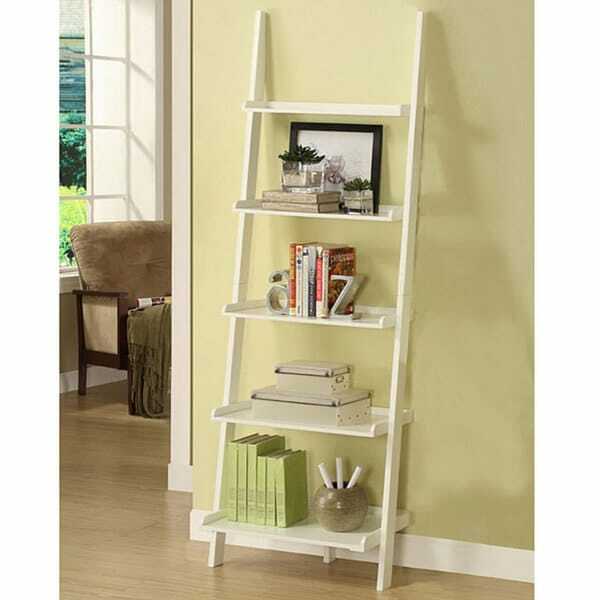 Whether your decor is modern or traditional, the ladder shelf stacks up in style. The minimalist, no nonsense look adds style and matches easily with your existing home decor. Lean it against any wall in your home to provide compact and versatile storage for books, art, family photos, keepsakes and more. The shelf, when assembled, does not stand flush again the wall because the little supporting piece that goes in the back of the bottom tier is too long. I had to unscrewed that piece, did some measurement, and used a sew to cut off about an inch of it. Now it stands flush again the wall and is no longer wobbly. The shelves look good in person and were easy to assemble. They are not very sturdy though. One shelf started to break after I filled it with larger books. They are good for holding some books and decor, but probably not the best to be filled entirely with books. I really like this shelf and am glad I ordered it. The underside of the shelves are not painted well but you can't see them so it really doesn't matter. The only thing I REALLY WISH is if the instructions were clear and gave caution to putting it together. Be VERY careful to attach the side pieces to the shelves. The dowels do not fit and pushing them into the sides will break the side piece. Instead, put the dowels into the shelves and hammer them in, then attach the sides. IF I had known to do that, I would not have broken the side pieces in two places. Nevertheless, it is a good product. It is very cute and I am pleased with the item. I am. Very happy with my new bathroom ladder to hold my towels, wash cloths and a shelf for my perfume and candles. It is perfect and I plan on purchasing one for my daughters new home. Love it. It is even cuter in person. Fits perfectly flush at the top against the wall even with wide floor molding. I bought this for my grand daughter for her birthday. She wanted to change her bedroom and the five-tier leaning ladder shelf was an added touch to her room. Actually it is more like a conversation piece. She is 13 and thrilled with her gift filled with keepsakes on each shelf. I found this item while reading a recent issue of HGTV magazine. They featured the ladder shelf's use in many different rooms. I have a blank wall in my kitchen, but not any more. As soon as I saw how they utilized the ladder shelf in a kitchen, I was sold! I went right on line and ordered one. It has received many compliments from family and friends. Although it said it took two people to assemble it, I did it alone and it was not very difficult. It is well made, which pleased me - a lot. I was able to clear a lot of stuff off my kitchen counters. I am now thinking about purchasing another one for use in another room. I bought 4 of these and lined them up next to each other in my entry hallway They fill the space perfectly. As one earlier reviewer had suggested, I left the screw covers off all of the shelves, except for the two outer sides; this way, they abut one another without any space in between each shelf. I am using these shelves to display a variety of interesting odds and ends - fossils, field guides and other books, shells, vacation souvenirs, etc. They seem plenty sturdy for this purpose. I'm not sure that I would load down every single shelf with heavy books, but these shelves are definitely sturdy enough to accommodate stacks of books here and there among the knickknacks. As other reviewers have noted, they are very open and airy and give the room a sense of space. I am very pleased with this shelf. I bought it for my daughter's bedroom and it is exactly what I was looking for. I was going to buy one at the furniture store for $300, so glad I did not - this one is just as nice. I would highly recommend. As long as you're okay with putting together these shelves (which is not difficult) they are great if you're looking for extra storage but don't have a lot of room. I really like this shelf but the barrel screws and screw just would not come together on one side. I finally used my own screw because I wasn't taking it back apart to ship back. You get what you pay for with this piece. It was cheaply designed. The load on each shelf must be perfectly balanced or it will tilt toward the front or back. It is also very unsturdy unless anchored to the wall. It takes the paint off the walls wherever it touches them. I don't recommend this for displaying precious items or for homes with pets or children. We originally ordered this to use by our front door, but it looks better in the corner of the living room. We put board games on the bottom, books on the middle shelves, and a few small picture frames on the top shelf. It really adds a lot to the room! This was the perfect size for my small NYC studio apartment. Easy to assemble on your own and good quality. Would buy again. It is also very light so easy to carry! Great addition to my sub room for my plants and supplies. Great storage in a small footprint! We use this in our bathroom, which doesn't have a lot of storage space. We've had it for years and it's still in great shape. Would definitely recommend this product. This attractive piece is great for books and knickknacks. It was easy to assemble and it is well-made. It’s great for small spaces and corners. Great for my daughter's trophies, good quality. We have had this for several years and it's still just as sturdy. We bought it for my daughter's room. There is plenty of space to store books as well as other knick knacks! Loved this ladder when I does purchased it but after some time you can tell that it is not good quality. Love this ladder shelf. Hold all my shells and pictures and is very beachy. Friends that come over always comment on it and ask where I got it from. I even ordered a black one for my other room. I would definitely order again! This shelf has held up well, even surviving moves. It's exactly as described and is stable and looks lovely in the space I purchased it for. "CAN I USE IT TO PUT CABLE BOX AND WIFI BOX"
The weight capacity is 10 pounds per shelf. "what brackets are not there? Do I need to purchase brackets?" Thank you so much, for such a helpful response. Have a great day! "I would like to use this as an over-the-toilet shelving unit by taking the bottom three shelves off. Would it stay stable?" No, it wouldn't, the side bars are very thin! It depends on what you would be placing on the remaining shelves, and if you are handy to reinforce the shelves, maybe. I would not remove the bottom three shelves, but rather the bottom two - that should still give you toilet clearance height. By removing the very bottom shelf, you are essentially removing a "third" leg that is stabilizing the shelf unit. To keep it from sliding forward, I would buy rubber coasters at your local hardware store so that the bottom feet don't slip. And then I might want to reinforce the remaining shelves with small "L" brackets to make sure they are totally secured to the side bars that are holding the shelves together. "would it be possible to display shoes on this shelf?" Shoes could be placed on the shelves. I imagine you could use this to display shoes, the top shelf isn't very deep but the other 4 should do the trick. "How deep is each shelf, please?" I have this shelf...5 actually. I love it! The depth of the 5 shelves are as follows, from top to bottom: 5 5/8", 8", 10-3/8, 12-3/4 and the bottom shelf is 15-1/4 deep. "Would you say this item is bright white or antique white?" Hello BadgerMom, we try to represent the colors of our products accurately. Unfortunately, due to the difference in monitor colors we cannot guarantee that the color will match exactly what you see on your screen. We would recommend reading some of the reviews for first hand accounts of the color. Thank you for shopping with us. "What is the measurement from the floor to the bottom shelf? As in how many inches from the bottom shelf to the floor. Thanks." The bottom shelf is about 5-1/4 inches from the floor. How to Find a Stud for Installing Shelves from Overstock.com. Our guides provide customers with information about how to find a stud for installing shelves.